Google’s Android Market has undergone some tremendous changes over the last year or so. What started as just a standalone app store has quickly grown to encompass e-books, music, videos, and now Google feels like the “Android Market” moniker is getting to be too restrictive, too constraining for what they’re really trying to deliver to their users. That’s why Google is officially putting the Android Market name to rest. Starting today, all of Google’s digital media services have been rebranded to fly under a brand new banner: Google Play . That’s right gadget buffs, despite some delectable new rumors Google Play isn’t a new tablet from the folks at Mountain View, but rather a unified brand that seeks to tie the company’s digital media services together. According to Google Engineering Director Chris Yerga, the rebranding was something Google has been contemplating for quite some time, but the company felt that this was the “natural time” to pull the trigger. Google has spent months and months building out the Android Market into a digital media hub, but constantly invoking the Android name seems to have led to a sense of exclusion for some users. There’s nothing about the process of renting movies, purchasing music, or skimming through e-books from Google that requires anyone interested to actually own an Android device. All of a user’s pertinent media is stored in Google’s considerable cloud and accessible from run-of-the-mill web browsers, and Google wants to drive that point home with the new Google Play brand. As the rebrand goes live, you’ll see that most of Google’s new cosmetic efforts come into play on the web. The Android Market website has been drastically revamped to place more emphasis on the rest of the digital media that Google offers users — instead of occupying small, easy to miss tabs along the top of the page, links to Google’s Books, Music, and Video subsections and related offers now occupy prime real estate at eye-level. That isn’t to say that changes won’t take place on your Android device of choice too. 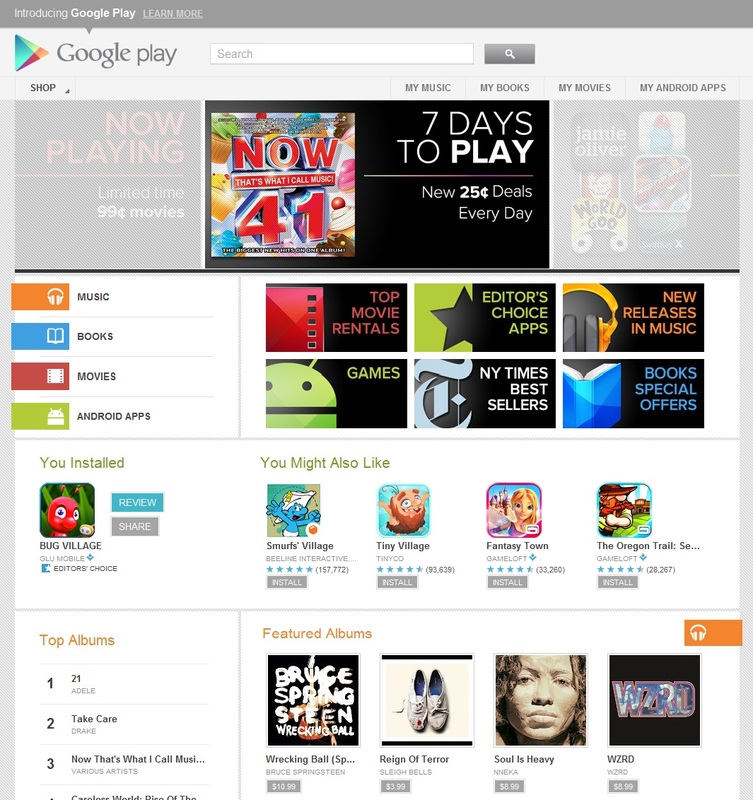 The venerable Android Market will be renamed the Google Play Store, while similar name changes will go into effect for Google’s slew of playback apps — the Google Music app for example will now be called Google Play Music. Simple enough, right? In usual Google fashion, the updates for the affected apps will go live today and will continue to roll out over the next few days. That’s pretty much it as far as changes to the device side go — Android users have been able to access Google’s catalog of books, movies, and songs from within the Android Market app ever since their most recent design change went into effect. This new focus on uniting Google’s digital media services on the web underscores a key concept that the search giant is hoping to drive home — the media ecosystem that they’ve created isn’t just meant for Android devices, but for users of all stripes. Yerga tells me that Google’s intent with Google Play was to not only break down the “silos” that Google’s content types were lumped into, but also to “break down the barriers between content consumption and the store experience.” Sadly, there’s no word yet if devices like Google TV units (or the mysterious Google home boxes currently in testing) will be able to enjoy the new Play media hub.